Employer Guide: What Employee Compensation Is Taxable? When it comes to figuring taxable income for our employees, it can be difficult to sort out what's taxable to the employees and what is not. It seems like every kind of income is taxable, but that's not necessarily true. This article looks at the types of payments a business makes to employees, which of these payments are taxable, and any exceptions. It also answers questions about the value of benefits and withholding on benefits. Employee pay and benefits that are taxable must be included on Form W-2, the employee's Wage and Tax Statement. Form W-2 is a complicated form, and many types of income are included. This discussion is general and it's not meant to give you all the details of specific situations. IRS regulations for taxable employee pay and benefits are complicated, and there are many limitations and exclusions. See the information at the end of this article if you want to dig into the details of any of these items. Employee gross income is taxable to the employee, including overtime pay for non-exempt employees and certain lower-income exempt employees. All tip income. Tip income is included with all other income in the relevant boxes on Form W-2. Notice that allocated tips (those determined by a formula for all tipped employees) are to be shown in Box 8, but not in other income items. Employee commissions are included in taxable income. If an employee received advance commissions for services to be performed in the future, those commissions are, in most cases, taxable when received by the employee. If an employee is using a company car for business purposes, the personal mileage driven by the employee is taxable as a benefit. You can give the employee an allowance for business use of the car, and this allowance is not taxable. Stock options may be taxable to employees when the option is received, or when it is exercised, or when the stock is disposed of. Read more about how stock options are taxed. If an employer pays the cost of an accident or health insurance plan for his/her employees, including an employee’s spouse and dependents, the employer’s payments are not wages and are not subject to Social Security, Medicare, and FUTA taxes, or federal income tax withholding. Bonuses, awards, and gift to employees are generally taxable to the employee. This includes gift cards and items given at holiday times.The exception is de minimis (small) payments given to employees on an infrequent basis. Worker's compensation benefits are not taxable to employees. Commuter and transportation benefits from businesses to their employees are typically excluded from being taxed. There are exceptions and limits, so read more about how these commuting and transportation benefits work, including bicycling, parking, and mass transit benefits. Meals provided to employees may not be taxable if they are small and infrequently provided. The IRS has complicated rules about what employer-provided meals are and are not taxable. The cost of up to $50,000 of life insurance provided to employees isn't included in their income. Life insurance costs paid by your company of over $50,000 are taxable to employees. This cost is included in Box 1 and in Box 12 of the W-2 as one of the options. Educational assistance benefits under $5,250 paid to employees in a calendar year are not taxable to the employee if there are provided as part of a qualified educational assistance program. For more information on educational assistance programs, see IRS Publication 971. Working condition benefits are generally not taxable. These are products or services provided by the employer for employees to help them work. These benefits include, for example, tools and equipment and uniforms. Employer contributions to an IRS-qualified retirement plan for employees are not taxable to the employee at the time the contribution is made. But withdrawals from 401(k) or IRA retirement plans are subject to tax (both the employer contribution and the employee contribution). Just to make things more complicated, you must withhold federal and state income taxes from taxable pay and benefits. In addition, you must withhold FICA taxes (Social Security and Medicare) from some, but not all of these benefits. IRS Publication 15-B lists all applicable benefits and what withholding must be taken. The value of pay is pretty easy to determine, but what about the value of a gift or of a meal or a transportation benefit? Valuing some of these benefits that are taxable to employees can be tricky. The IRS has a general valuation rule that is used to determine the value of most fringe benefits. Typically, the value is the fair market value; that is, what is the price in an arms-length transaction. Here's an example? What's the value of an employee's use of company fitness facilities? It's probably the cost of a membership if the facility were operating on a for-profit basis. Are These Payments Deductible to My Business? Most payments you make to employees and employee benefits are deductible business expenses to your company. This is a trade-off between with payments and benefits being deductible to the business and taxable to the employee. For example, if you provide a laptop to an employee, the business use of this item is deductible to you as the employer. Any personal use is taxable to the employee. The cost of providing commuter and transportation benefits to employees is not tax-deductible to employers. The cost of providing meals to employees at your worksite (a cafeteria, for example) was previously deductible at 100% but it's now deductible only at 50%. The tax credit for employer-provided child care is no longer available. Who Is An Employee for These Tax Purposes? This information is to help business owners in understanding taxable pay and benefits to employees. It doesn't include payments to independent contractors except for direct payment for services. A 2% shareholder is someone who directly or indirectly owns (at any time during the year) more than 2% of the corporation's stock or stock with more than 2% of the voting power. Treat a 2% shareholder as you would a partner in a partnership for fringe benefit purposes, but don't treat the benefit as a reduction in distributions to the 2% shareholder. 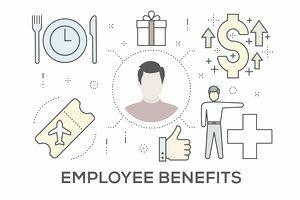 You can find more detailed information on the tax status of various employee benefits in IRS Publication 15-B, and IRS Publication 525 has more details on employee compensation and taxes.